The Eurofighter Typhoon is a twin-engine canard-delta wing multirole aircraft. It is being designed and built by a consortium of three companies: Alenia Aeronautica, BAE Systems, and EADS working through a holding company Eurofighter GmbH which was formed in 1986. The project is managed by NETMA (NATO Eurofighter and Tornado Management Agency) which acts as the prime customer. The series production of the Eurofighter Typhoon is underway, and the aircraft is being procured under three separate contracts (named "tranches"), each for aircraft with generally improved capabilities. The aircraft has entered service with the British Royal Air Force, the German Luftwaffe, the Italian Air Force, the Spanish Air Force and the Austrian Air Force. Saudi Arabia has signed a �4.43 billion (approx. €6.4 billion c. 2007, $9.5 billion) contract for 72 aircraft. The UK had identified a requirement for a new fighter as early as 1971. A specification, AST 403, issued by the Air Staff in 1972, resulted in a conventional "tailed" design known as P.96, which was presented in the late 1970s. While the design would have met the Air Staff's requirements, the UK air industry had reservations as it appeared to be very similar to the McDonnell Douglas F/A-18 Hornet, which was then well advanced in its development. The design had little potential for future growth, and when it entered production it would secure few exports in a market in which the Hornet would be well established. Simultaneously, by 1979 the West German requirement for a new fighter had led to the development of the TKF-90 concept. This was a cranked delta wing design with forward canard controls and artificial stability. 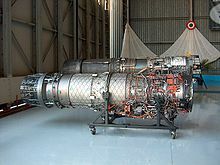 Although the British Aerospace designers rejected some of its advanced features such as vectoring engine nozzles and vented trailing-edge controls, they agreed with the overall configuration. In 1979 British Aerospace and Messerschmitt-Bx�lkow-Blohm presented a formal proposal to their respective governments for the ECF, the European Collaborative Fighter or European Combat Fighter. In October 1979 Dassault joined the ECF team for a tri-national study, which became known as the European Combat Aircraft. It was at this stage of development that the Eurofighter name was first attached to the aircraft. The development of different national prototypes continued. France produced the ACX. The UK produced two designs; the P.106 was a single-engined "lightweight" fighter, superficially resembling the JAS 39 Gripen, the P.110 was a twin-engined fighter. The P.106 concept was rejected by the RAF, on the grounds that it had "half the effectiveness of the two-engined aircraft at two thirds of the cost". West Germany continued to refine the TFK-90 concept. The ECA project collapsed in 1981 for several reasons including differing requirements, Dassault's insistence on "design leadership" and the British preference for a new version of the RB199 to power the aircraft versus the French preference for the new SNECMA M88. As a result the Panavia partners (BAe, MBB and Aeritalia) launched the Agile Combat Aircraft (ACA) programme in April 1982. The ACA was very similar to the BAe P.110, having a cranked delta wing, canards and a twin tail. One major external difference was the replacement of the side mounted engine intakes with a chin intake. The ACA was to be powered by a modified version of the RB199. The German and Italian governments withdrew funding, however the UK Ministry of Defence agreed to fund 50% of the cost with the remaining 50% to be provided by industry. MBB and Aeritalia signed up with the aim of producing two aircraft, one at Warton and one by MBB. In May 1983 BAe announced a contract with the MoD for the development and production of an ACA demonstrator, the Experimental Aircraft Programme. In 1983 the UK, France, Germany, Italy and Spain launched the Future European Fighter Aircraft (FEFA) programme. The aircraft was to have Short Take Off and Landing (STOL) and Beyond Visual Range (BVR) capabilities. In 1984 France reiterated its requirement for a carrier-capable version and demanded a leading role. The UK, West Germany and Italy opted out and established a new EFA programme. In Turin on 2 August 1985 Italy, West Germany and the UK agreed to go ahead with the Eurofighter. The announcement of this agreement confirmed that France, along with Spain, had chosen not to proceed as a member of the project. Despite pressure from France, Spain rejoined the Eurofighter project in early September 1985. France officially withdrew from the project to pursue its own ACX project, which was to become the Dassault Rafale. By 1986, the cost of the program had reached 180 million British Pounds. When the EAP program had started, the cost was supposed to be equally shared by both government and industry, but the West German and Italian government wavered on the agreement and the three main industrial partners had to provide 100 million British Pounds to keep the program from ending. In April 1986 the BAe EAP was rolled out at BAe Warton, by this time also partially funded by MBB, BAe and Aeritalia. The EAP first flew on 6 August 1986. The Eurofighter bears a strong resemblance to the EAP. Design work continued over the next five years using data from the EAP. Initial requirements were: UK: 250 aircraft, Germany: 250, Italy: 165 and Spain: 100. The share of the production work was divided among the countries in proportion to their projected procurement - British Aerospace (33%), DASA (33%), Aeritalia (21%), and Construcciones Aeronx�uticas SA (CASA) (13%). The Munich based Eurofighter Jagdflugzeug GmbH was established in 1986 to manage development of the project and EuroJet Turbo GmbH, the alliance of Rolls-Royce, MTU Aero Engines, FiatAvio (now Avio) and ITP for development of the EJ200. 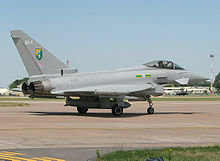 The aircraft was known as Eurofighter EFA from the late 1980s until it was renamed EF 2000 in 1992. By 1990, the selection of the aircraft's radar had become a major stumbling block. The UK, Italy and Spain supported the Ferranti Defence Systems-led ECR-90, while Germany preferred the APG-65 based MSD2000 (a collaboration between Hughes (of the USA), AEG and GEC-Marconi). An agreement was reached after UK Defence Secretary Tom King assured his West German counterpart Gerhard Stoltenberg that the British government would underwrite the project and allow GEC to acquire Ferranti Defence Systems from its troubled parent. GEC thus withdrew its support for the MSD2000. The maiden flight of the Eurofighter prototype took place on 27 March 1994. Dasa chief test pilot Peter Weger took the prototype on a test flight around Bavaria. The 1990s saw significant arguments over work share, the specification of the aircraft and even participation in the project. On 9 December 2004, Eurofighter Typhoon IPA4 began three months of Cold Environmental Trials (CET) at the Vidsel Air Base in Sweden, the purpose of which was to verify the operational behaviour of the aircraft and its systems in temperatures between -25 and -31�C. In May 2007, Eurofighter Development Aircraft 5 made the first flight with the CAESAR demonstrator system, a development of the Euroradar CAPTOR incorporating Active Electronically Scanned Array (AESA) technology. The maiden flight of Instrumented Production Aircraft 7 (IPA7), the first fully equipped Tranche 2 aircraft, took place from EADS' Manching airfield on 16 January 2008. When developed, the production version of the CAPTOR-E radar is being proposed as part of Tranche 3 of the Typhoon from 2012. Tranche 2 aircraft use the non AESA, mechanically scanned Captor-M which incorporates weight and space provisions for possible upgrade to CAESAR (AESA) standard in the future. However Italian Air Force doubts that the AESA radar will be ready in time for Tranche 3 production. Picture - A German Luftwaffe Eurofighter Instrumented Production Aircraft. 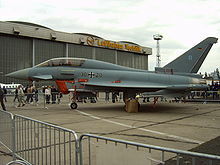 The first production contract was signed on 30 January 1998 between Eurofighter GmbH, Eurojet and NETMA. The procurement totals were as follows: UK 232, Germany 180, Italy 121, and Spain 87. Production was again allotted according to procurement: British Aerospace (37%), DASA (29%), Aeritalia (19.5%), and CASA (14%). On 2 September 1998, a naming ceremony was held at Farnborough, England. This saw the Typhoon name formally adopted, however initially for export aircraft only. This was reportedly resisted by Germany; perhaps because the Hawker Typhoon was a fighter-bomber aircraft which served with the RAF during the Second World War against German targets. Strangely, the name "Spitfire II" (for the famous British WWII fighter, the Supermarine Spitfire) had also been considered and rejected for the same reason early in the development program. In September 1998 contracts were signed for production of 148 Tranche 1 aircraft and procurement of long lead-time items for Tranche 2 aircraft. In March 2008 the final aircraft out of Tranche 1 was delivered to the German Luftwaffe, with all successive deliveries being at the Tranche 2 standard. On 21 October 2008, the first two of 91 Tranche 2 aircraft, ordered four years before, were delivered to RAF Coningsby. In October 2008, the Eurofighter nations were considering splitting the 236-fighter Tranche 3 into two parts. In June 2009, RAF Air Chief Marshal Sir Glenn Torpy suggested that the RAF fleet might only be 123 jets, instead of the 232 previously planned. In spite of this reduction in the number of required aircraft, on May 14, 2009, British Prime Minister Brown confirmed that the UK would move ahead with the third batch purchase. A contract for the first part, Tranche 3A was signed at the end of July 2009 for 112 aircraft split across the four partner nations, including 40 aircraft for the UK, 31 for Germany, 21 for Italy and 20 for Spain. In 1988 the Parliamentary Under-Secretary of State for the Armed Forces told the UK House of Commons that the European Fighter Aircraft would "be a major project, costing the United Kingdom about �7 billion". It was soon apparent that a more realistic estimate was �13 billion, made up of �3.3 billion development costs plus �30 million per aircraft. By 1997 the estimated cost was �17 billion; by 2003, �20 billion, and the in-service date (2003; defined as the date of delivery of the first aircraft to the RAF) was 54 months late. Since 2003 the Ministry of Defence have refused to release updated cost estimates on the grounds of 'commercial sensitivity'. The financial burdens placed on Germany by reunification caused Helmut Kohl to make an election promise to cancel the Eurofighter. In early to mid-1991 German Defence Minister Volker Rx�he sought to withdraw Germany from the project in favour of using Eurofighter technology in a cheaper, lighter plane. However due to the amount of money already spent on development, the number of jobs dependent on the project, and the binding commitments on each partner government, Germany was unable to withdraw; "Rx�he's predecessors had locked themselves into the project by a punitive penalty system of their own devising." In 1995 concerns over workshare appeared. Since the formation of Eurofighter the workshare split had been agreed at the 33/33/21/13 (United Kingdom/Germany/Italy/Spain) based on the number of units being ordered by each contributing nation. However, all the nations then reduced their orders. The UK cut its orders from 250 to 232, Germany from 250 to 140, Italy from 165 to 121 and Spain from 100 to 87. According to these order levels the workshare split should have been 39/24/22/15 UK/Germany/Italy/Spain, Germany was however unwilling to give up such a large amount of work. In January 1996, after much negotiation between UK and German partners, a compromise was reached whereby Germany would purchase another 40 aircraft. The workshare split is now 43% for EADS MAS in Germany and Spain; 37.5% BAE Systems in the UK; and 19.5% for Alenia in Italy. The next major milestone came at the Farnborough Airshow in September 1996. The UK announced the funding for the construction phase of the project. In November 1996 Spain confirmed its order but Germany again delayed its decision. After much diplomatic activity between the UK and Germany, an interim funding arrangement of DM 100 million (€ 51 million) was contributed by the German government in July 1997 to continue flight trials. Further negotiation finally resulted in German approval to purchase the Eurofighter in October 1997. On 21 November 2002, DA-6, the Spanish twin-seat prototype crashed due to a "double engine flame-out", said to be specifically related to the experimental trial standard of engine being used by that aircraft. The aircraft went down but the two crew members escaped unhurt. The Eurofighter Typhoon is unique in modern combat aircraft in that there are four separate assembly lines. Each partner company assembles its own national aircraft, but builds the same parts for all 683 aircraft (including exports). A fifth assembly line will be established for the final 48 Saudi aircraft. Production is divided into three tranches (see table below). Tranches are a production/funding distinction, and do not necessarily infer an incremental increase in capability with each tranche. Tranche 3 will most likely be based on late Tranche 2 aircraft with improvements added. Tranche 3 has been split into A and B parts. Tranches are further divided up into production standard/capability 'blocks' and funding/procurement 'batches', though these do not coincide, and are not the same thing e.g. the Eurofighter designated 'FGR4' by the RAF is a Tranche 1, Block 5. Batch 1 covered Block 1, but Batch 2 covered Blocks 2, 2B and 5. Note: The change in Austria's order from 6 Tranche 1 and 12 Tranche 2 aircraft to 15 Tranche 1 jets led to a reduction in Tranche 1 quantities for the four partner nations, with a commensurate increase in Tranche 2 numbers. 24 Saudi aircraft were taken from UK Tranche 2 production, and were to have been replaced at the end of Tranche 2, but will now 'count' against the UK's Tranche 3A total. This marks an effective reduction of 24 aircraft in the UK order total. On 2 July 2002, the Austrian government announced the decision to buy the Typhoon as its new air defence aircraft. The purchase of 18 Typhoons was agreed on 1 July 2003, and included training, logistics, maintenance, and a simulator. On 26 June 2007, Austrian Minister for Defense Norbert Darabos announced a reduction to 15 aircraft. The first aircraft was delivered on 12 July 2007 and formally entered service in the Austrian Air Force. After unsuccessful campaigns in South Korea and Singapore, on 18 August 2006 it was announced that Saudi Arabia had agreed to purchase 72 Typhoons. In November and December it was reported that Saudi Arabia had threatened to buy French Rafales because of a UK Serious Fraud Office investigation into the Al Yamamah ("the dove") defence deals which commenced in the 1980s. However on 14 December 2006 Britain's attorney general, Lord Peter Goldsmith, ordered that the Serious Fraud Office discontinue its investigation in the BAE Systems' alleged bribery to senior Saudi officials in the al-Yamamah contracts, citing "the need to safeguard national and international security". The Times has raised the possibility that RAF production aircraft will be diverted as early Saudi Arabian aircraft, with the service forced to wait for its full complement of aircraft. This arrangement would mirror the diversion of RAF Tornados to the RSAF. However, The Times has also reported that such an arrangement will make the UK purchase of its tranche 3 commitments more likely. On 17 September 2007 Saudi Arabia confirmed it had signed a GB�4.43 billion contract for 72 aircraft. 24 aircraft will be at the Tranche 2 build standard, previously destined for the UK RAF, the first being delivered in 2008. The remaining 48 aircraft will be assembled in Saudi Arabia and delivered from 2011. Saudi Arabia is considering an order of 24 additional jets in the future, more recent reports suggest that number may be as high as 60 or 72. On 22 October 2008 an aircraft in the full two-tone grey livery of the Royal Saudi Air Force flew for the first time at BAE Systems’ Warton Aerodrome, marking the start of an initial test flight programme for RSAF aircraft. Also in October 2008, the United States Department of State gave its approval for the sale that was needed because the Eurofighter contains a significant amount of American technology (ITAR). Following the official handover event of the first Eurofighter Typhoon to the Royal Saudi Air Force on 11 June 2009, the delivery ferry flight took place, as planned, on 23 June 2009. Eurofighter Typhoon is one of the bidders in the Indian MRCA Competition, worth $10.5 billion, to supply the Indian Air Force with 126 'Multi-Role Combat Aircraft'. The other competitors are the Boeing F/A-18IN, Dassault Rafale, JAS 39 GripenNG/IN, Mikoyan MiG-35, and F-16IN Fighting Falcon. Bernhard Gerwert, CEO of military air systems, said that India is invited to join the Eurofighter Typhoon programme as a partner. The production of the Eurofighter Typhoon will create thousands of new jobs in India. He also said that in order to win the contract, EADS would move avionics jobs from Germany to India. The campaign is fully supported by the four European nations (Germany, United Kingdom, Spain and Italy), their four Air Forces and Europe's leading aerospace companies Alenia/Finmeccanica, BAE Systems and EADS. 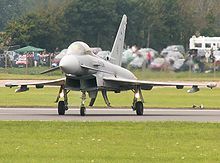 In January 2010, India's ambassador to Italy, Arif Shahid Khan, said that the Eurofighter was "leading the race" to win the MRCA competition. In March 2007, Jane's Information Group reported that the Typhoon was the favourite to win the contest for Japan's next-generation fighter requirement. The other competitors then were the F/A-18E/F Super Hornet and F-15E Strike Eagle. On 17 October 2007, Japanese Defence Minister Shigeru Ishiba confirmed that Japan may buy the Typhoon. Although the F-22 Raptor was in his words "exceptional", it was not "absolutely necessary for Japan", and the Typhoon was the best alternative. The F-22 is currently unavailable for export per US law. During a visit to Japan in June 2009, Andy Latham of BAE pointed out that while F-22 exports were restricted to keep advanced military technology from falling into the wrong hands, selling the Typhoon would take a "no black box approach", that is that even licensed production and integration with Japanese equipment would not carry the risk of leakage of restricted military technology. In 1999, the Greek government agreed to acquire 60 Typhoons in order to replace its existing second-generation combat aircraft. However, the purchase was put on hold due to budget constraints, largely driven by other development programs and the need to cover the cost of the 2004 Summer Olympics. In June 2006 the government announced a 22 billion euro multi-year acquisition plan intended to provide the necessary budgetary framework to enable the purchase of a next-generation fighter over the next 10 years. The Typhoon is currently under consideration to fill this requirement. During the 2008 Farnborough Airshow it was announced that Oman was in an "advanced stage" of discussions towards purchasing EF Typhoons as a replacement for its Jaguar aircraft. Oman remains interesting in ordering Typhoons in April 2010. Other potential customers of the Typhoon are Bulgaria, Croatia, Canada, Denmark, and Romania. BAE Systems itself reports that Typhoon is "actively being promoted in a number of other markets including Greece, Switzerland, Turkey and Japan". However, Turkey has indicated that it would rather just buy more F-35 Lightning II fighters. On 2 December 2009, BAE Systems stated it will propose the Typhoon as replacement for the Royal Malaysian Air Force (RMAF) Mikoyan MiG-29N which is to be phased out in late 2010. According to the Regional Director-Business Development Dave Potter, the Typhoon's multi-role capabilities allow it to replace the MiG-29N. Other contenders include Boeing F/A-18E/F Super Hornet, F-15 Eagle, Dassault Rafale, JAS 39 Gripen NG, Sukhoi Su-35, and Lockheed F-16C/D Block 52 Fighting Falcon. In 2002, the MBDA Meteor was selected as the long range air-to-air missile armament of Eurofighter Typhoon. Pending Meteor availability, Typhoon will be equipped with the Raytheon AMRAAM. The current in-service date for Meteor is predicted to be August 2012. In 2009, Eurofighter operators and manufacturers are considering upgrading the current fleet with the possibility of adding the MBDA Meteor missile and an Active Electronically Scanned Array radar. 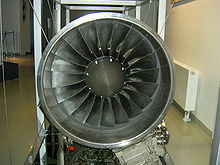 Eurojet is attempting to find funding to test a thrust vectoring nozzle (TVN) on a flight demonstrator. The RAF is working on fitting conformal fuel tanks (CFT) to free up limited underwing space for weapons. The Typhoon features lightweight construction (82% composites consisting of 70% carbon fibre composites and 12% glass reinforced composites) with an estimated lifespan of 6000 flying hours. The fighter achieves high agility at both supersonic and low speeds by having a relaxed stability design. It has a quadruplex digital fly-by-wire control system providing artificial stability, as manual operation alone could not compensate for the inherent instability. The fly-by-wire system is described as "carefree" by preventing the pilot from exceeding the permitted manoeuvre envelope. Picture - Royal Air Force Typhoon taking off. Roll control is primarily achieved by use of the wing flaperons. Pitch control is by operation of the foreplanes and flaperons, the yaw control is by rudder. Control surfaces are moved through two independent hydraulic systems that are incorporated in the aircraft, which also supply various other items, such as the canopy, brakes and undercarriage. Each hydraulic system is powered by a 4000 psi engine-driven gearbox. Navigation is via both GPS and an inertial navigation system. The Typhoon can use Instrument Landing System (ILS) for landing in poor weather. The aircraft employs a sophisticated and highly integrated Defensive Aids Sub-System named Praetorian (formerly called EuroDASS). Threat detection is provided by a Radar Warning Receiver (RWR), a Missile Approach Warning (MAW) and a Laser Warning Receiver (LWR, only for UK Typhoons). Protection is provided by Chaff, Jaff and Flares, Electronic Counter Measures (ECM) and a Towed Radar Decoy (TRD). Praetorian monitors and responds automatically to the outside world. It provides the pilot with an all-round prioritised assessment of Air-to-Air and Air-to-Surface threats. It can respond to single or multiple threats. The aircraft also features an advanced Ground Proximity Warning System (GPWS) based on the TERPROM Terrain Referenced Navigation (TRN) system used by Tornado but further enhanced and fully integrated into the cockpit displays and controls. The Multifunctional Information Distribution System (MIDS) provides the Link 16 data link. The Eurofighter Typhoon features a "glass cockpit" without any conventional instruments. It includes: three full colour Multi-function Head Down Displays (MHDDs) (the formats on which are manipulated by means of softkeys, XY cursor and voice (DVI) command), a wide angle Head Up Display (HUD) with Forward Looking Infra Red (FLIR), Voice & Hands On Throttle And Stick (Voice+HOTAS), Helmet Mounted Symbology System (HMSS) (known to test pilots as 'The Electric Hat'), Multifunction Information Distribution System (MIDS), a Manual Data Entry Facility (MDEF) located on the left glareshield and a fully integrated aircraft warning system with a Dedicated Warnings Panel (DWP). Reversionary flying instruments, lit by LEDs, are located under a hinged right glareshield. The pilot flies the aircraft by means of a centre stick and left hand throttles. Emergency escape is provided by a Martin-Baker Mk.16A ejection seat, with the canopy being jettisoned by two rocket motors. The Typhoon DVI system utilises a Speech Recognition Module (SRM), developed by Smiths Aerospace (now GE Aviation Systems) and the then Computing Devices (now General Dynamics UK). 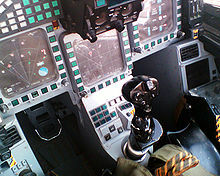 It was the first production DVI system utilised in a military cockpit. DVI provides the pilot with an additional natural mode of command and control over approximately 26 non-critical cockpit functions, to reduce pilot workload, improve aircraft safety, and expand mission capabilities. An important technological breakthrough during the development of the DVI occurred in 1987 when Texas Instruments produced their TMS-320-C30 Digital Signal Processor (DSP). This greatly advanced the packaging of DVI from large complex systems to a single card module. This early advance allowed a viable high performance system. The project was given the go ahead in July 1997, with development and pilot assessment carried out on the Eurofighter Active Cockpit Simulator at BAE Systems Warton. The DVI system is speaker-dependent, i.e. requires each pilot to create a template. It is not used for any safety-critical or weapon-critical tasks, such as weapon release or lowering of the undercarriage, but is used for a wide range of other cockpit functions. Voice commands are confirmed by visual or aural feedback. The system is seen as a major design feature in the reduction of pilot workload and even allows the pilot to assign targets to himself with two simple voice commands, or to any of his wingmen with only five commands. In the standard aircraft, g protection is provided by the full-cover anti-g trousers (FCAGTs). This specially developed g suit provides sustained protection up to 9 g. The Typhoon pilots of the German Air Force and Austrian Air Force wear a hydrostatic g-suit called Libelle (dragonfly) Multi G Plus instead, which also provides protection to the arms, theoretically allowing for more complete g tolerance. The design of the cockpit had involved the inputs from both test and operational pilots from each of the four partner nations from the feasibility and concept stage and throughout the design process. This has necessitated the use of specially commissioned lighting and display modelling simulation facilities and the extensive employment of rapid prototyping techniques. The Passive Infra-Red Airborne Track Equipment (PIRATE) system is an Infrared Search and Track System (IRST) mounted on the port side of the fuselage, forward of the windscreen. SELEX Galileo is the lead contractor which, along with Thales Optronics (system technical authority) and Tecnobit of Spain, make up the EUROFIRST consortium responsible for the system's design and development. PIRATE operates in two IR bands, 3-5 and 8-11 micrometres. When used with the radar in an air-to-air role, it functions as an Infrared Search and Track system (IRST), providing passive target detection and tracking. In an air-to-surface role, it performs target identification and acquisition. It also provides a navigation and landing aid. PIRATE is linked to the pilot’s helmet mounted display. Eurofighters starting with Tranche 1 Block 5 have the PIRATE. The first Eurofighter Typhoon with PIRATE-IRST was delivered to the Italian Aeronautica Militare in August 2007. More advanced targeting capabilities can be provided with the addition of a targeting pod such as the LITENING pod. I have flown all the air force jets. None was as good as the Eurofighter. The Eurofighter is both agile and sophisticated, but is still difficult to compare to the F/A-22 Raptor. They are different kinds of airplanes to start with; it's like asking us to compare a NASCAR car with a Formula One car. They are both exciting in different ways, but they are designed for different levels of performance. Further, "The Eurofighter is certainly, as far as smoothness of controls and the ability to pull (and sustain high g forces), very impressive", he said. "That is what it was designed to do, especially the version I flew, with the avionics, the color moving map displays, etc. - all absolutely top notch. The maneuverability of the airplane in close-in combat was also very impressive." In July 2007, the Indian Air Force fielded the SU 30 MKI during the Indra-Dhanush exercise with Royal Air Force's Eurofighter Typhoon. This was the first time that the two jets had taken part in such a exercise. The IAF did not allow their pilots to use the radar of the MKIs during the exercise so as to protect the highly-classified N011M Bars. During the exercise, the RAF pilots candidly admitted that the Su-30MKI displayed maneuvering superior to that of the Typhoon but they had studied, prepared and anticipated this. The IAF pilots on their part were also visibly impressed by the Typhoon's agility in the air. The Typhoon is capable of supersonic cruise without using afterburners. This is referred to as supercruise. According to the official German Luftwaffe and Austrian Eurofighter website, the maximum speed possible without reheat is between Mach 1.2 and Mach 1.5. Air Forces Monthly gives a maximum supercruise speed of Mach 1.1 for the RAF FGR4 multirole version. However the Eurofighter can only supercruise in a clean configuration without external missiles and fuel tanks. The Eurofighter consortium claims their fighter has a larger sustained subsonic turn rate, sustained supersonic turn rate, and faster acceleration at Mach 0.9 at 20,000 feet (6,100 m) than the F-14 Tomcat, F-15 Eagle, F-16 Fighting Falcon, F/A-18 Hornet, Dassault Mirage 2000, Dassault Rafale, the Sukhoi Su-27, and the Mikoyan MiG-29. In 2005, a trainer Eurofighter T1 was reported to have had a chance encounter the previous year with two U.S. Air Force F-15Es over the Lake District in the north of England. The encounter became a mock dogfight with the Eurofighter allegedly emerging victorious. In the 2005 Singapore evaluation, the Typhoon won all three combat tests, including one in which a single Typhoon defeated three RSAF F-16s, and reliably completed all planned flight tests. Singapore still went on to buy the F-15 due to uncertainty over Typhoon tranche 2 delivery dates. During the exercise "Typhoon Meet" held in 2008, Eurofighters flew against F/A-18 Hornets, Mirage F1s, Harriers and F-16s in a mock combat exercise. It is claimed that the Eurofighters won all engagements (even outnumbered 8 vs 27) without suffering losses. The aviation magazine "Flug Revue" reports that in 2008 German Typhoon were pitted against French Rafales. The results are said to be "extremely gratifying", the main difference being the "much greater thrust of the EJ200 engine". In July 2009, Former Chief of Air Staff for the Royal Air Force Air Chief Marshal Sir Glenn Torpy said that "The Eurofighter Typhoon is an excellent aircraft. It will be the backbone of the Royal Air Force along with the JSF". The Typhoon is a multi-role fighter with maturing air-to-ground capabilities. Earlier than scheduled, the RAF integrated the air to ground capability, based on the Rafael/Ultra Electronics Litening III laser designator and the Enhanced Paveway II/III laser guided bomb under the "Austere" programme. A more comprehensive air-to-ground attack capability including Paveway IV, EGBU-16 bombs and a higher degree of automation will be achieved for all partner nations with the Phase 1 Enhancements currently in development. The absence of such a capability is believed to have been a factor in the type's rejection from Singapore's fighter competition in 2005. At the time it was claimed that Singapore was concerned about the delivery timescale and the ability of the Eurofighter partner nations to fund the current capability packages. With the planned Phase 2 Enhancements Eurofighter GmbH hopes to increase the appeal of Typhoon to possible export customers and to make the aircraft more useful to partner air forces. Although not designated a stealth fighter, measures were taken to reduce the Typhoon's radar cross section (RCS), especially from the frontal aspect. An example of these measures is that the Typhoon has jet inlets that conceal the front of the jet engine (a strong radar target) from radar. Many important potential radar targets, such as the wing, canard and fin leading edges, are highly swept, so will reflect radar energy well away from the front sector. Some external weapons are mounted semi-recessed into the aircraft, partially shielding these missiles from incoming radar waves. In addition radar absorbent materials (RAM) developed primarily by EADS/DASA coat many of the most significant reflectors, e.g. the wing leading edges, the intake edges and interior, the rudder surrounds, strakes, etc. The Typhoon does not use internal storage of weapons. External mounting points are used instead, which increases its radar cross section but allows for more and larger stores. The Eurofighter operates automatic Emission Controls (EMCON) to reduce the Electro-Magnetic emissions of the current mechanically scanned Radar. The Captor-M was the first NATO-Radar with three rather than two working channels, one intended for classification of jammer and for jamming suppression. The German BW-Plan 2009 indicates that Germany will equip/retrofit the Luftwaffe's Eurofighters with the AESA Captor-E from 2012. 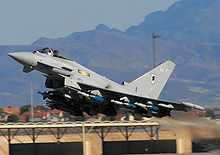 The conversion to AESA will give the Eurofighter a Low Probability of Intercept Radar with much better jam resistance. These include an innovative design with a gimbal to meet RAF requirements for a wider scan field than a fixed AESA. The coverage of an fixed AESA is limited to 120 degree in azimuth and elevation. According to the RAF, the Eurofighter's RCS is better than RAF requirements. Comments from BAE Systems suggest the radar return is around one quarter of that of the Tornado it replaces. The Eurofighter is thought to have an RCS of less than one square metre in a clean configuration by author Doug Richardson, although no official value is available. This compares with the estimated RCS of the Rafale of 2 square metres, the 20 square metres of the Su-30MKI, the 1 square metre of the Su-35BM and the American F-117 of 0.025 square metres. The manufacturers have carried out tests on the early prototypes to optimize the low observability characteristics of the aircraft from the early 1990s. Testing at BAe's Warton facility on the DA4 prototype measured the RCS of the aircraft and investigated the effects of a variety of RAM coatings. Another measure to reduce the likelihood of discovery is the use of passive sensors, which minimises the radiation of treacherous electronic emissions. While canards generally have poor stealth characteristics, the flight control system is designed to minimise the RCS in flight, maintaining the elevon trim and canards at an angle to minimise RCS. On 4 August 2003, Germany accepted the first series production Eurofighter (GT003). Also that year, Spain took delivery of its first series production aircraft. On 16 December 2005, the Typhoon reached I.O.C. with Italian Air Force as an air defence fighter from Grosseto Air Base. On 9 August 2007, the UK's Ministry of Defence reported that No. XI Squadron of the RAF, which stood up as a Typhoon squadron on 29 March 2007, had taken delivery of its first two multi-role Typhoons. Two of XI Squadron's Typhoons were sent to intercept a Russian Tupolev Tu-95 approaching British airspace on 17 August 2007. 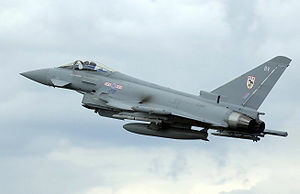 The RAF Typhoons were declared combat ready in the air-to-ground role by 1 July 2008. The RAF Typhoons will be ready to deploy for operations by mid-2008. On or around 25 April 2008 a Typhoon from 17 Squadron at RAF Coningsby, operating at the US Naval Air Weapons Station China Lake test centre in California, USA, suffered extensive damage during landing when its landing gear did not deploy. Although no immediate cause was determined it was speculated that pilot error may have been to blame. A Board of Enquiry was convened. On 11 September 2008, the combined flying time of the five customer Air Forces and the industrial Flight Test programme saw aircraft surpass the 50,000 flight hours milestone. On 31 March 2009 a Eurofighter Typhoon fired an AMRAAM for the first time whilst having its radar in passive mode, the necessary target data for the missile was acquired by the radar of a second Eurofighter Typhoon and transmitted using the Multi Functional Information Distribution System (MIDS). On 17 July 2009, Italian Air Force Eurofighters were deployed to protect Albania's airspace. In September 2009, four RAF Typhoons deployed to RAF Mount Pleasant replacing the Tornado F3s defending the Falkland Islands. The government of Argentina "is understood to have made a formal protest". Picture - Prototype on display at the 1998 Dubai Airshow. The multiple roundels for the air forces are: (left to right) Spanish Ej�rcito del Aire, Italian Aeronautica Militare, British Royal Air Force, and German Luftwaffe. The Eurofighter is produced in single-seat and twin-seat variants. The twin-seat variant is not used operationally, but only for training. The aircraft has been manufactured in three major standards; seven Development Aircraft (DA), seven production standard Instrumented Production Aircraft (IPA) for further system development and a continuing number of Series Production Aircraft. The production aircraft are now operational with the partner nation's air forces. The Tranche 1 aircraft were produced from 2000 onwards. Aircraft capabilities are being increased incrementally, with each software upgrade resulting in a different standard, known as blocks. With the introduction of the Block 5 standard, the R2 retrofit programme began to bring all aircraft to that standard. Block 1 : Initial Operational Capability and basic Air Defence Capability. Block 2 : Initial air-to-air capabilities. 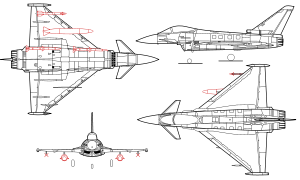 Block 2B : Full air-to-air capabilities. Block 5 : Full Operational Capability (FOC) by combining existing air-to-air role with air-to-ground capabilities. Block 8 : New mission computers required for the integration of future weapons such as Meteor, Storm Shadow and Taurus. (Differences in the build to Tranche 1 related to changes in production technology or obsolescence). These aircraft will have interfaces for possible future improvements, but will be delivered at a Tranche 2 level of capability. The Indian Navy has made a request for information for a carrier based variant of the Eurofighter. In this contest it will once again be up against the Rafale, which split from the Eurofighter project over the need for a carrier based variant. Eurofighter DA-2 Typhoon (serial number ZH588) is on display at the Royal Air Force Museum. This aircraft is one of seven EF 2000 development aircraft built by the Eurofighter Partner Companies, and was used for flight testing. The aircraft was delivered by road on 22 January 2008. Engineers from RAF Coningsby and RAF St. Athan assembled the aircraft for display. It is hanging in the Museum's Milestones of Flight Exhibition Hall. The first development aircraft Eurofighter DA-1 can be seen at the German Museum subsidiary Flugwerft Schleix�heim at Schleix�heim Airport in the north of Munich. Its first flight took place in 1994 and it was handed over to the museum in 2008. In summer 2009 Eurofighter DA-4, serial number ZH590, went on display at Imperial War Museum Duxford, having been given to the museum by the Ministry of Defence in 2008. It is exhibited as part of the museum's 'AirSpace' gallery, as an example of the development of aircraft technology. Up to 3 drop tanks for ferry flight or extended range/loitering time. Buttler, Tony. British Secret Projects: Jet Fighters Since 1950. Hinckley, UK: Midland Publishing, 2000. ISBN 1857800988. Harkins, Hugh. Eurofighter 2000, Europe`s Fighter for the New Millennium (Aerofax 6). Earl Shilton, UK: Midland Publishing, 2006 (previous edition 1997). ISBN 1-85780-068-0. Matthews, Henry. Prelude to Eurofighter: EAP (Experimental Aircraft Programme) (X-Planes Profile-1 ). Beirut, Lebanon: HPM (Henry Paul Matthews) Publications, 2000. Spick, Mike. "Eurofighter Typhoon." The Great Book of Modern Warplanes. St. Paul, Minnesota: MBI Publishing Company, 2000. ISBN 0-7603-0893-4.